Waldo County Emergency Management Agency, led by Director Dale Rowley, held a multi-agency mass casualty exercise on July 19 at Thorndike High School. The scenario involved an “active shooter” with multiple deaths and injuries. Waldo County ARES/RACES was tasked with relaying information from the scene in Thorndike back to the Emergency Operations Center in Belfast. 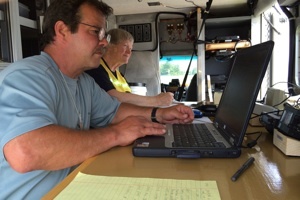 They used the county’s converted ambulance “Comm Truck” with its vast complement of amateur radio and public safety communications equipment to accomplish that mission. Other than a few FM voice transmissions to report on scene arrivals and similar reports, the ham radio operators used digital modes to quickly and accurately transmit text and graphical data to other hams staffed at the EOC. MA Staff) and Phil Duggan (SEC) N1EP, and sent them via the Narrow Band Emergency Messaging System (NBEMS) using the FLDIGI suite of programs and modes. They also used EasyPal to transmit high density photographs to the EOC. EasyPal can be described as slow scan tv on steroids. The images transferred can be high resolution and be of great value to emergency managers. Waldo County ARES Emergency Coordinator John Butler KB1ROT, Mike Ellis W1MAE and others operated the radio systems at the EOC in Belfast. The communications between EOC and the Comm Truck went smoothly and proved NBEMS/FLDIGI and other digital modes are effective EmComm tools for ARES/RACES to use when appropriate. Several communities’ first responders participated in the exercise and there were also other county EMA staff participating, including Hancock County EMA Director Andrew Sankey KB1TGL, and Cumberland County EMA Staff Harry Masters II KA1NXJ.